Hello all, My name is Matt, I coming from an Engineering/ Machining background. I am brand new to Mastercam, but I have professional experience with Solidworks and Autocad (2d only with autocad). I am currently doing the Mill Design and Tool paths course using the Mastercam student version. I have been having quite a bit of trouble here and there because the videos were created with an older version, however I have been able to find solutions to most problems with experimenting, googling etc. I am having trouble with part 4 Triple Tree, I am required to draw lines using the line normal feature. I select the hole centre and click and the line appears nowhere near the centre I selected. I have set up the levels as instructed. Because I am studying on the weekends my local distributor is closed whenever I need help, when I signed up for the course it was never explained to me who my "teacher" or contact person is... is it this forum? 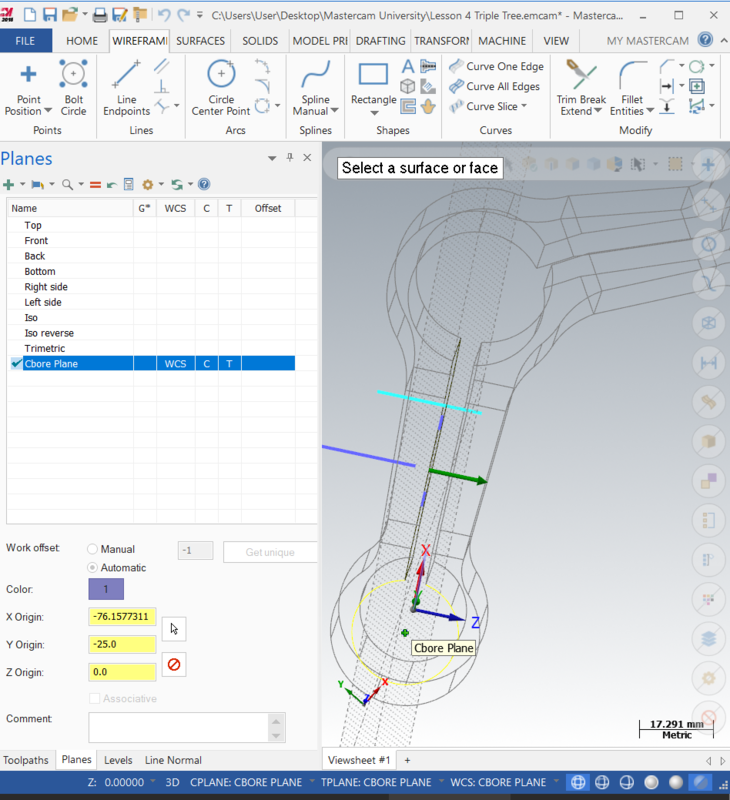 Coming from a Solidworks background it has been a long time since I used levels, I used to use them in Autocad 2d to define different types of geometry for basic engineering drawings. I am struggling to understand levels in a 3d sense, for example in this tutorial the tutor has asked us to create a new level and a new plane to draw these holes, I am struggling to understand why I need both. Why do the holes need a level at all. I guess I am asking for a precise definition of what a level is in mastercam. Once I have a definition for a level then I can understand it. I am also not sure (it has not been explained) how levels relate to datums when I enter co ordinates to locate features. Note - in the photo I have clicked reverse normal to highlight where the line is snapping to. The snap location appears random. Thanks for any help you can give, I am hoping I have just missed something simple. Looking at the picture you added it looks like you are selecting the wrong face when creating the line normal. In the picture I have attached you can see the inside face that the holes are set onto is the one you should be selecting. The front face of the arm and the inside slot face are not parallel . 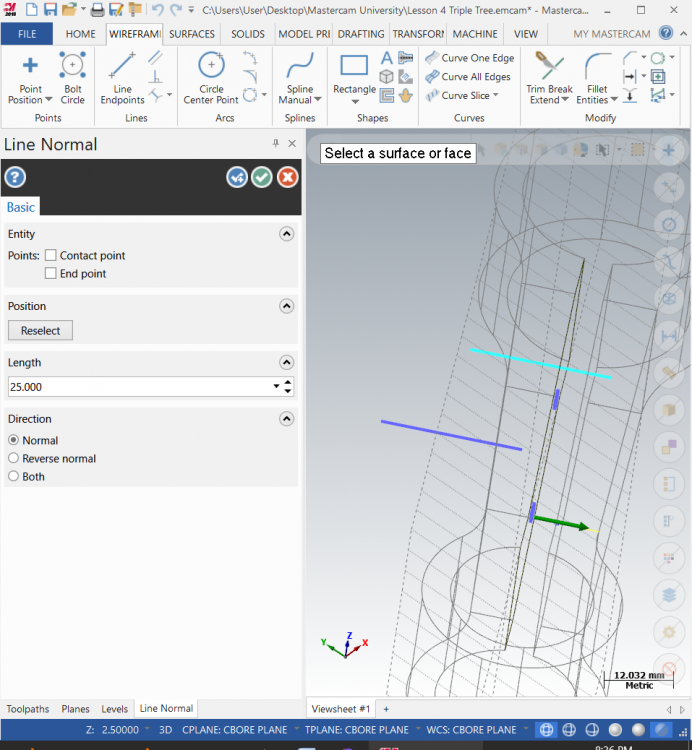 By selecting front face the line is going to be on a different normal then the hole you are trying create the line on. Levels are used as a way to reduce screen clutter or separate geometry. You are able to copy or move geometry to a different level. These level can then be turned off to remove the geometry from the screen and back on again when needed. Imagine if you have a part that has hundreds of features it would get very cluttered if everything was left on one level and could not be turned off. Thanks for helping me understand levels, it still seems weird to me that a plane can be created on a level but it is somehow independent from level it was created on. I guess I have spent too much time using design trees on SW. Planes are not created on Levels. Planes are completely separate entities from levels. 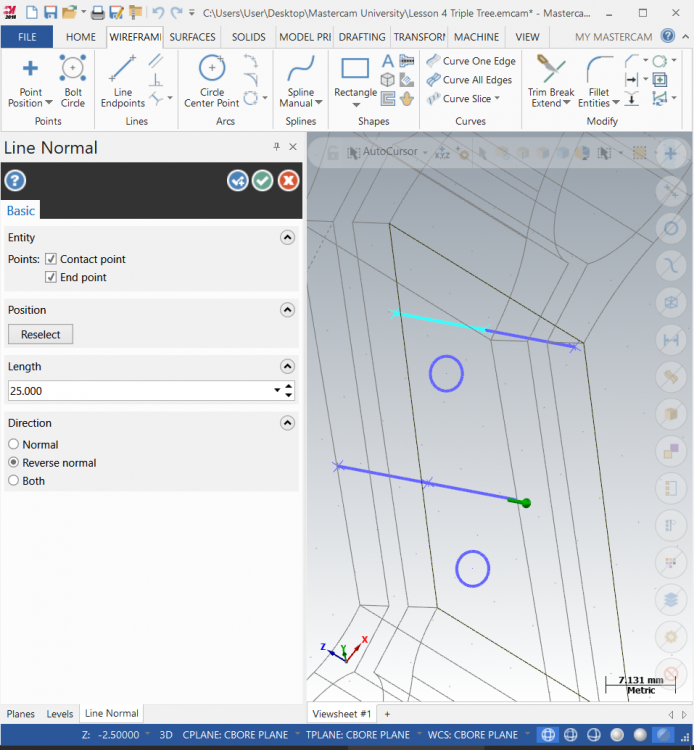 Planes allow you to orientate your part on any angle, or any direction that you please. This controls how your tool paths are going to work when you get into programming the part. Levels however are like Rob said, they allow you to store geometry/surfaces/splines/and solids on separate levels so that you can "hide/unhide" them easily. For example at my work we use levels to separate Surfaces from our Wire frame. We also setup a level for Tool path Geometry, and Bounding Box. 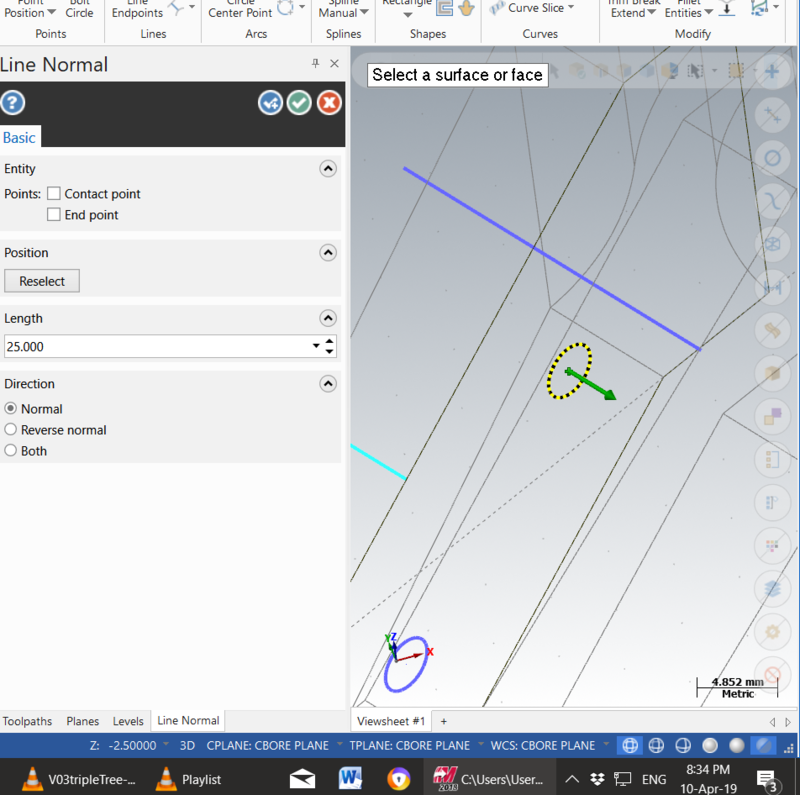 This way if I need to select a surface, and ONLY a surface, I can turn off every level except my "Surfaces" level and then all I will see is what is stored on that "Level"
I am still not sure why you are unable to set the line normal to the center of the circle. Could you post the file and I could have a look at it? Thanks for the video, I have just tried doing it exactly as per the video and I am still having the same problem. I have also just found out (if I understand this software correctly) that most people on this forum won't be able to open my student version file? That is correct, educational users use the .emcam extension. Thanks for the tips radical1, unfortunately they haven't solved the problem.